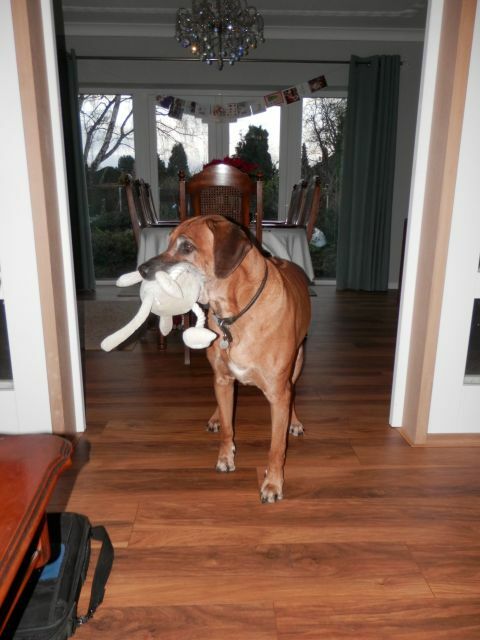 Louis got a new toy for Christmas from Sharon (thank you!). He was pushing it with his snout whilst it was being opened – the hound has no manners and no patience. As soon as it was revealed he grabbed it and ran off. There was about 5 minutes of staring at it coupled with mad spinning around and then he decided it needed to be buried so he went to the back door. No way was he being let out for this so we tried to get the toy off him. Louis not being a team player with his new toy. One week later and the toy is by the back door whilst he waits for his moment when we aren’t watching him closely. At that time it will suffer the same fate as his Santa hat which gets buried a few times a year.